Orange County Mayor Teresa Jacobs and the Board of County Commissioners recognized Winter Garden resident Sisaundra Lewis, finalist of NBC’s The Voice, at the BCC meeting this morning with her family by her side. 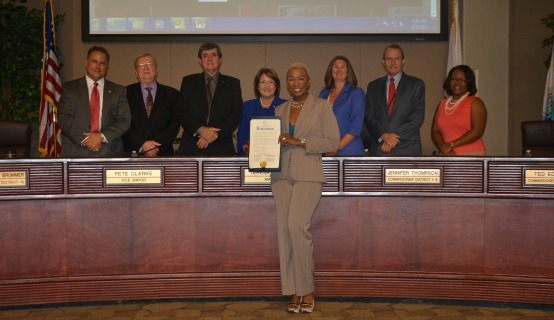 Proclaiming June 3 as Sisaundra Lewis Day in Orange County, the BCC recognized Lewis for positively representing Orange County on the national stage. Born in Polk County, Lewis is one of eight children and grew up singing in her father’s church. Since then, she’s had phenomenal success as a singer, writer, producer and performer including being “the voice” behind Cirque du Soleil’s La Nouba for 10 years. She also worked as Celine Dion’s vocal director in the past and was the featured narrator in the Oscar nominated documentary Sustaining Life. In September 2005, her debut single “SHOUT” hit the U.S. Billboard Hot Dance Club Charts in its first week and immediately climbed to number one. She followed up this success with the release of her full-length album in 2006. On season six of The Voice, Lewis competed on “Team Blake” and made it to the quarterfinals of the competition. Lewis also greeted Sunrise Elementary School students, from grades third through fifth, who were being recognized for their success at the Battle of the Books competition. The students won first place against other Orange County Public Schools in a quiz style contest where they answered questions about a variety of books that have been nominated for the Sunshine State Readers Award. A collection of photos from the visit and BCC meeting are available for media use on Flickr.